For many RVers, fall means the end of their camping season. With chilly weather approaching, owners need to be proactive and winterize their RV to protect it during the cold and snowy months ahead. 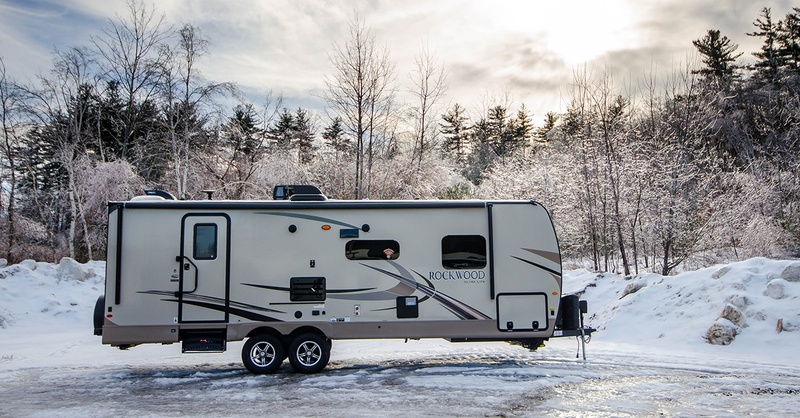 Follow these 14 tips to keep your RV in tip-top shape throughout the winter. Thoroughly clean your RV’s interior. Empty all drawers and cupboards. Remove all bedding, towels and linens. Unplug and store all electric appliances. Empty and defrost fridge/freezer if needed. Plug with non-rusting metal dish scrub pad to prevent rodents and insects from entering. Place dryer sheets or cedar chips the interior to prevent pest infestation. Place natural dehumidifiers to prevent mold. Thoroughly wash your RV’s exterior. Clean all debris from slides and seams to prevent leaks. Inspect all seals and seams. Repair areas that are cracked or torn. Inspect exterior for any further damage. Schedule repairs if necessary. 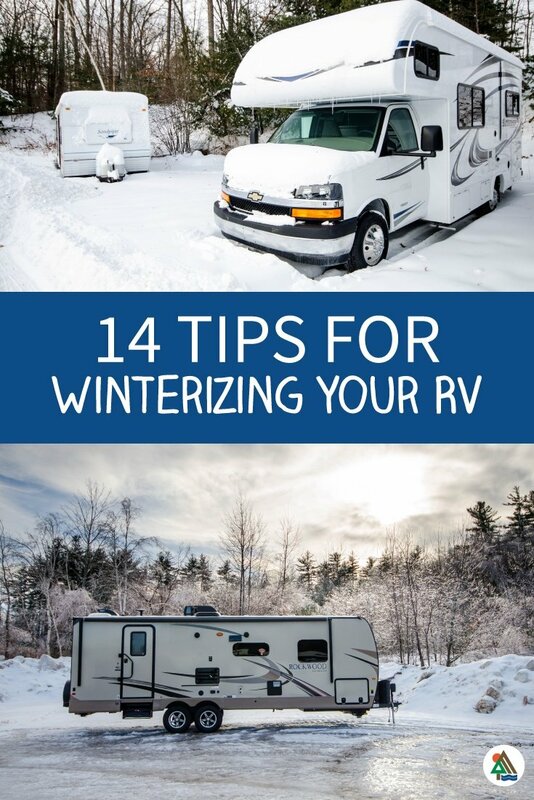 See our Ultimate Guide to Winterizing Your RV for detailed instructions with pictures. Pump potable antifreeze into your water system until full. (See our Ultimate Guide to Winterizing Your RV for detailed instructions with pictures). Ensure all doors, windows, storage compartments and slides are closed and sealed shut. If you are not using a storage unit, apply a cover to your RV’s exterior to prevent leaks. Apply covers to your RV’s tires to prevent dry rot. Begin dreaming about all the adventures you’ll have next season! 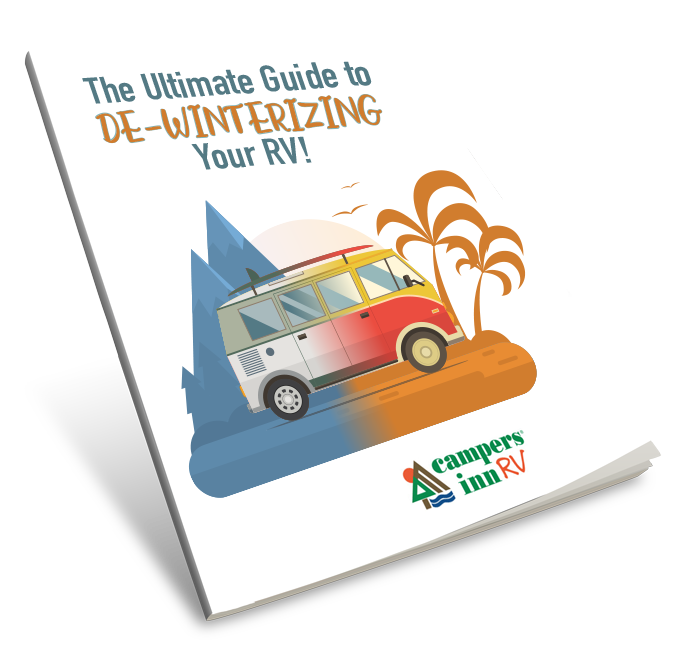 For a detailed step-by-step guide, download our free Ultimate Guide to Winterizing Your RV.